“The Suebian knot (German:Suebenknoten) is a historical male hairstyle ascribed to the tribe of the Germanic Suebi. The knot is attested by Tacitus in his 1st century CE work Germania, found on art by and depictions of the Germanic peoples, and worn by bog bodies. Polat Kaya: I have already identified the so-called “Germanic SUEBIANS” in detail as being none other than the Turanian Tur/Turk/Oguz peoples and their soldiers in my writing “THE REAL IDENTITY OF THE ANCIENT GALATIAN / GALLAECIAN PEOPLE (HALLSTATT, AUSTRIA AN ANCIENT PLACE OF GALATIANS) given in link http://www.polatkaya.net/Hallstatt.htm: The following is a section from that link that is relevant to the names SUEBI or SUEVI or SWABIA. Polat Kaya: The Alemanni (Alman) people were part of a confederation of Suebian Germanic tribes located on the upper Rhine River as the above reference states. Let us now understand this name. In view of this statement, we have to investigate the identity of the SUEBIANS (SUEVIANS). First of all, the Suebians (Suevians) were Turanian warrior peoples just like the so-called Vikings (i.e., Ascomanni who were from Turkish "Bir Kumanli Turks, Bir Kipchak Turks") were. The so-called "Suebian Germanic tribes", as explained for the SICAMBERIAN (SUGAMBERIAN) tribe above, were also Turanian soldier tribes. This we get from the name "SUEBI" and "SUEVI" also. a) The name SUEVI deciphered as "US EVI" is the altered form of the Turkish word "US-EVI" (UZ-EVI) meaning "home of Oguz", that is, the House of Turkish Oguz peoples. Additionally, the name SUEVI is the Turkish saying "US-EVI" meaning "home of wisdom, home of knowledge". Thus, these two meanings together described the SUEBIAN people as well educated people. b) The name SUEVI is the Turkish word "SÜ-EVI" meaning "home of soldier; army", that is, the Turkish military establishment. Additionally, the name SUEVI is the Turkish word "SU-EVI" meaning "home of water, home of the sea". Thus, the two meanings together mean the country of land and water soldiers. Turkish word SÜ means "soldier; army", SU means "water, sea" and EV means "home, house, country". c) Similarly, the name SUEBI is the altered form of the Turkish word "SÜ-BEI" meaning "lord of soldier", that is, "commander of soldier". Presently, in the Turkish army "SÜ-BEI" is expressed with the Turkish word "SUBAY" (SÜBEY) which means "military commander" and covers all military ranks from "ON BAŞI" meaning "head of ten soldiers" up to "ORGENERAL (PAŞA) as commander of an Army unit. SUBAY ranking increases depending on the size of the military unit that they command. d) Similarly, the name SUEBI is the altered form of the Turkish word "SU-BEI" meaning "lord of Sea", that is, "commander of sea soldiers". Turkish word SU means "water, sea" and BEY means "lord, commander". In this writing, I discuss the so-called SUEBIAN KNOT which was a stylish knot where the Süebian warriors combed their hair back or sideways and tied it into a knot. This SUEBIAN KNOT is shown in Figure 1 below in the Coat of Arms of Osterby in Germany showing a sun symbol and a Suebian knot . Figure 1. Coat of Arms of OSTERBY or OSTERBEK. or “OĞUZ TUR BEK” indicating that the land belonged to Turanian Oğuz Tur Lords. “OĞUZ TUR BEY” as in the name OSTERBY or OSTERBEK. Polat Kaya: In Figure 2 below, a Germanic (Alman) Suebian soldier is shown wearing a “Suebian knot”. This seems to be a Turanian soldier (i.e., SÜ in Turkish meaning “soldier; particularly a horse riding soldier as in Turkish name SÜVARİ”) kneeling in front of his superior! his hair in a "Suebian knot" (50–150 AD). Polat Kaya: We see a similar SÜEBIAN KNOT on the heads of the “Terracotta Warriors” of the Western Han Dynasty in China. The name HAN is a Turkish word and it is in the title of this so-called “Chinese” dynasty! “In Chinese history, Han consisted of two dynasties: the Western Han (206 BC - 24 AD) and the Eastern Han (25 - 220). During the period there were 24 emperors on the throne. Many were excellent contributing to the prosperity of the country with Emperors Gaozu, Wen, Jing and Wu among them. In view of these new identifications and revelations, it is much more likely that this so-called “Chinese” Dynasty was actually a Turanian Turkish Dynasty. Curiously, the soldiers are also wearing a “Süebian knot” which seems to be mostly on the right side of their head. Also, the tails of the terracotta horses are shown as being “tied” in a knot. See Figures 5 and 6 below. Tying the tail of a horse in a knot was and still is a Turanian Turkish tradition! Additionally, the Terracotta soldiers have a mustache which was a historical Turanian male trade mark. Figure 3. A Terracotta Warrior of the Western Han Dynasty with Suebian Knot. sınıf halktan ayiran bir simge olarak bu “Sü saç düğümü” kullanılıyormuş. “Sü saç düğümü” bağlanışı, benim görüşümde “kıravat” bağlaması gibidir. Figure 4. Terracotta Warriors of the Western Han Dynasty with Suebian Knot. Figure 5. Western Han Dynasty terracotta warriors and horses. 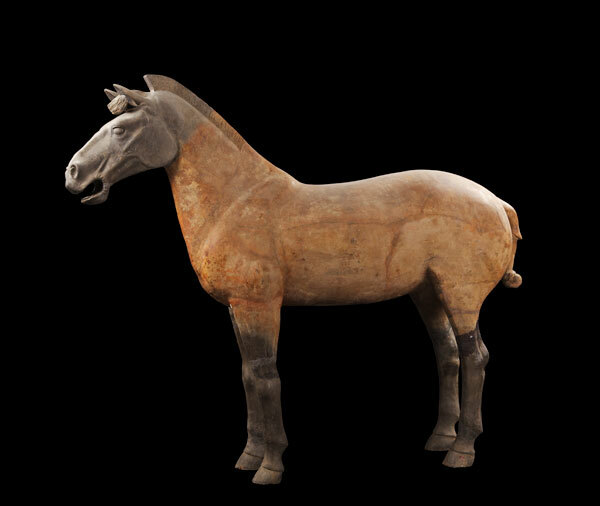 Polat Kaya: Note that the tails of the terracotta horses of the Western Han Dynasty are shown tied in a “knot”. that this particular army of the Western Han Dynasty was most likely a Turanian army. Figure 6. A Western Han Dynasty horse with its tail tied in a knot as in Turkish culture. Figure 7. Guards dressed in Qin dynasty-style uniform marching on the ancient city wall in Xi’an. Polat Kaya: From this picture, it is clear that the so-called QIN Dynasty was the altered form of the Turkish GÜN Dynasty believing in the Sun-God of Turanians. The Red headdress of the soldiers in the picture above is evidence that they were also called Turkish “AL BASH” meaning “Red Heads”. It also appears that the standards carried by the soldiers have ox tails attached to them – another Turanian tradition. Even their boots have the upturned curly toes which is a Turanian tradition. Polat Kaya: Interestingly, the Terracotta Army of the Western Han Dynasty is also called as “the terracotta warriors and horses of Qin Shihuang”. The Chinese term “QIN SHIHUANG” deciphered as “ISHUGHAN QIN”, sounds very much like the Turkish expression “IŞIYAN GÜN” meaning “the shining Sun”. This changes the expression “the terracotta warriors and horses of Qin Shihuang” into “the terracotta warriors and horses of the shining Sun” which is a befitting title for the Han Dynasty! All of these findings point to this “terracotta army” probably being an ethnic Turanian army of Tur/Turk/Oguz peoples in China. And these Terracotta soldiers are very much the same as the Suebian soldiers of the SAKA Turks in North Western Europe wearing a Suebian knot on their heads. In concluding, I submit that these findings are very much Turanian and Turkish in their identity - both in Europe and in China - indicating how wide-spread the ancient Turanian identity was - in Europe and China as well as Central Asia and many other places. Those who study the ancient history of Europe and Asia must take these findings into consideration. After all, it is said that the Turanians antedated the Aryans in Asia and Europe [Britannica World Language Dictionary, Vol 2, 1963, page 1353].